A round wooden-framed felt tent covered in durable white canvas seems to be the most simple description of this portable home. 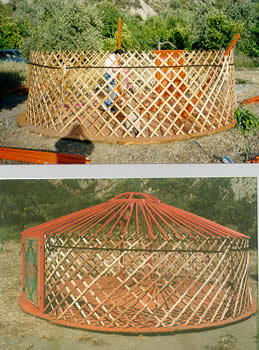 The Mongolian ger tent has two key components: the wooden frame work and the felt cover. The wooden lattice wall shell is called 'Khana'; the upper wooden poles (measuring 1.5 to 3 meters) are 'Uni'; the central supporting of two monumental central vertical poles are known as 'Bagana' and the uppermost smoke hole is named 'Toono' or 'Toghona' (roof crown). 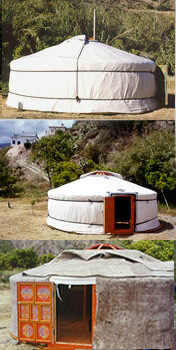 A Ger tent has 4 to 12 Khanas, depending on its size. The number of Uni or upper wooden poles range between 45 and 120, depending on the amount of Khanas. 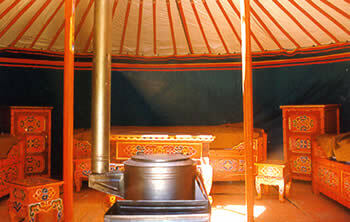 The ger tent has a round wooden floor made of black pine. The four wooden lattice Khanas, held together with camel leather straps, including the entrance door, are erected at the edge of the wooden floor. They are bound together with a very strong long rope made of horse and yak hair. 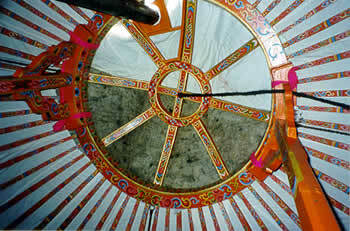 Tentpoles, all sixty six of them handpaintedly decorated, hold the roof and the Toono (roof crown) with their two monumental central vertical Bagana (poles), firmly in place. The inside of the wall has a beautiful decorated cloth (either in blue or green hue) complementing the inside of the Khana. The insulatory layer on the Khana has three felt sheets. The roof is covered with two felt sheets. The outside of the ger is covered with two layers of canvas. The outer canvas layer is waterproof. At the base of the outside of the ger tent is an additional canvas layer. The Toono or smoke hole may be partly covered with a rectangle felt and cotton cover; it can be adjusted with three horse and yak hair ropes. 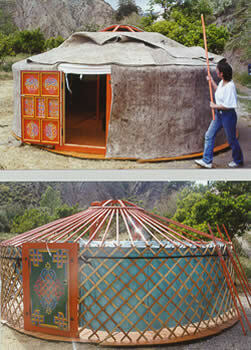 This authentic handmade Mongolian ger tent is solely made of natural durable materials. For details on purchasing, please go to heading Purchasing details at the bottom. The diameter of the ger being illustrated is ø 5.20 m. (21 m2) at € 3500,00 incl. furniture. Delivered with a wooden floor is € 4500,00. The height at the centre of the tent is 2.15 m.
A ger tent with a diameter of ø 6.20 m. (30 m2) is available at € 4500,00 incl. furniture. Delivered with a wooden floor is € 5500,00. The height at the centre of the tent is 2.15 m.
A ger tent with a diameter of ø 7.20 m. (40.5 m2) is available at € 5000,00 incl. furniture. Delivered with a wooden floor is € 6000,00. 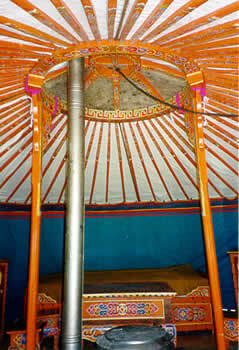 The height at the centre of the tent is 2.15 m.
Includes a complete stove, with a metal bucket for firewood storage. Two chests, one cupboard, four stools and one table. Two single bed frames with three blankets made of sheep wool. 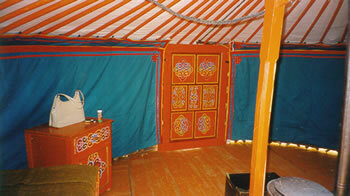 All wooden furniture is overly decorated by excellent craftsmen in Mongolia. Shipping, insurance, possible tax and instruction costs are not included. There is a sixteen months guarantee on all materials. A down-payment of 50% of the total price is an obligatory contribution. Would you be interested in more information and buying conditions in these authentic handmade Mongolian ger tents, please e-mail or telephone. When ordering more than one Ger tent there is manifestly discount. When wanting to view the Ger clip be patient while it loads for streaming. View the Ger construction Mp4 movie! View the Ger construction QuickTime movie! Download and make a paper cutout Ger! Disclaimer: Raya.org can not be made responsible for the content of this page.